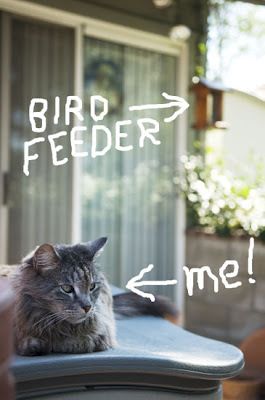 Bird Feeder or Cat Feeder? One of my owners, the pretty one, likes to feed the birds using one of these cheapo feeders which can be seen at the bottom right in this lousy photograph. 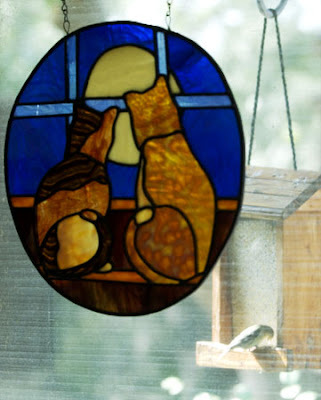 The stained glass piece is a custom made work of art depicting me wistfully gazing out the door predatorally contemplating a fine bird lunch. It's beyond me why someone would want to take the time, expend the effort, and waste the money on feeding birds. What she doesn't seem to understand is that birds ARE the food!! In this surveillance photo one of these tasty morsels can be seen feeding at the trough fattening himself up for his eventual demise. 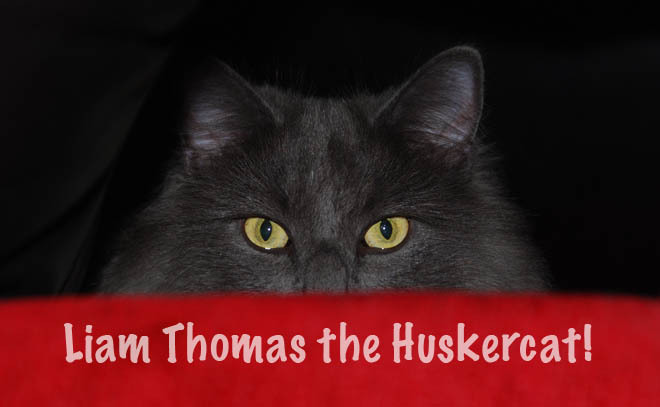 The quality of the photos lately has not been up to Huskercat standards. I'm not sure who I should complain to about this. Here I can be seen after trying to snag a couple of those birds for lunch. I wasn't lucky today, but I ended up with a plate of Fancy Feast Grilled Tuna in Gravy which is better anyway since there are no feathers in it. 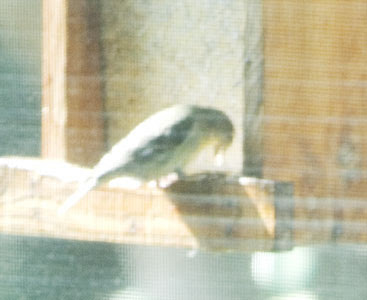 So should a bird feeder be called a cat feeder when there is a cat in the house? I don't care either - it's not like I'm a food linguist or something! As long as there is Grilled Tuna in Gravy all is good.